3-D images are first explained by the idea of the stereoscope. A stereoscope is a device invented by Charles Wheatstone (1802-1875) which produces the illusion of depth just by using two slightly different pictures. This device became popular for people to use. The photographs are taken with two lenses that are seperated as the same distance as the eyes. The photograph on the left is shown to the left eye while the photograph on the right is shown to the right eye. Therefore, the images are shown in the same manner that the individual would view the image. This idea is also used in 3-D films. The idea behind it, is that the left eye and the right eye images are presented at the same time on the screen to the viewers, but are slightly displaced from one another to create a sense of disparity. The images are shown seperately by coding the images for the left eye red and the right eye green or vice versa. The viewer then wears a set of glasses that act as filters with one lense colored red and the other colored green. 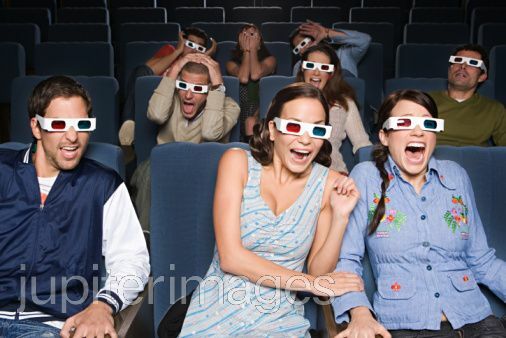 Currently, 3-D films have been the new trend. They always seem to bring fun and entertainment for all people who view them. I think all the different 3D things that have been coming out in the past few years are really cool. Sometimes, if your not used to it, it can be hard to adjust and a little awkward at first. But, for the most part it is a really neat experience and makes it much cooler than a normal movie! I found the latest 3D craze pretty exciting. Ive seen a few movies in imax that were insane. I never really understood the concept to wearing goofy paper glasses until now. Who would have thought that wearing a few extra colors around the eyes would help in making such a difference. I really like watching movies in 3D is very entertaining to feel such an illusion of depth by just wearing a pair of funny looking red and green glasses. Just to think that the illusion of depth started in the 1800's. Avatar was really cool to watch on 3D. If anyone ever gets a chance to go to Disney World's magic kingdom go to the Phillarmagic...The 3-D show was amazing and it combines the 3-D effect with feel taste and smell! Completly the whole package with all senses!